We have discussed this in previous posts but I believe my pets are my family. One of the hardest things I have had to deal with personally, is my pets getting old or sick. It is so difficult to read and understand as they suffer but it unfortunately happens to everyone, including our furry loved ones. Did you know that senior/aging pets makes up approximately 50% of the US pet population? The health care of these loved ones is a growing concern of us pet lovers. We currently have a senior cat who is 14 years old and one senior dog who is nine. Capone, our oldest dog, has always struggled with things like allergies and although he hasn't been diagnosed with it just yet, I am sure he has arthritis. So when Elimay Supplements asked me to review their Elimay Pain Care for dogs, I knew it would be something that might help my old man feel a bit better on those "down" days. "Elimay Pain Care is an all natural supplement that is helpful for dogs with inflammatory diseases including allergies, arthritis, and cancers. Elimay has been awarded the National Canine Cancer Foundation Seal of Approval. Elimay Supplements use BITS Technology®, which makes it easy to chew and swallow, or to simply twist into your dog's food." I love hearing how Elimay uses all natural ingredients like herbs such as turmeric and boswellia. Or the fact that they use the "highest pharmaceutical standards" since I consider my pets family. If I expect the best for myself and my children why wouldn't I of my furry kiddos. Now although I cannot tell you if this worked or not since Capone has yet to necessarily spout out, "Thank you momma", I can tell you there have been a few times I noticed he was moving slower and I decided it was time for a few doses. Because these are easily squeezed onto their food, I can disguise it without a thought from them. Again Capone hasn't necessarily mentioned he was feeling better but, ya know...a Mom just knows! Recommendation: I have to say I think this is a very reasonable price for the support it gives. I love the fact that it is all natural as well. I do have to say I hate to see it at a price of over $20 because I don't think many pet owners will spend a lot on something such as this unless instructed by their vet. 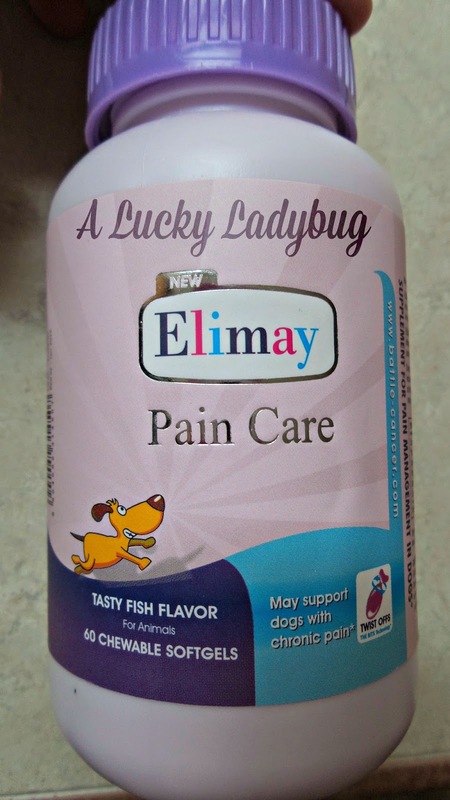 Giveaway: Elimay is going to give one of A Lucky Ladybug's lucky readers a bottle of Elimay Pain Care of their own! We have a 10 year old rough collie and 2 doxies who are about 8 years old each. Brutus the Boxer is 10 years old now. He still acts like a young pup in the yard, but gets a little sore and gimpy after playing too hard. I give him an Nsaid from the vet, but i don't want to use if he can do well on a natural supplement..
One of our pets is a dog, a pomeranian. We are not sure of his age, he was a rescue dog. He is at least 7 years old (when we got him) and he is starting to move slower and cannot jump onto our bed. Every now and then he yelps if he's picked up wrong. The vet says it's because he's getting older. I have a 10 year old Cocker Spaniel and he does seem to be suffering from joint pain. 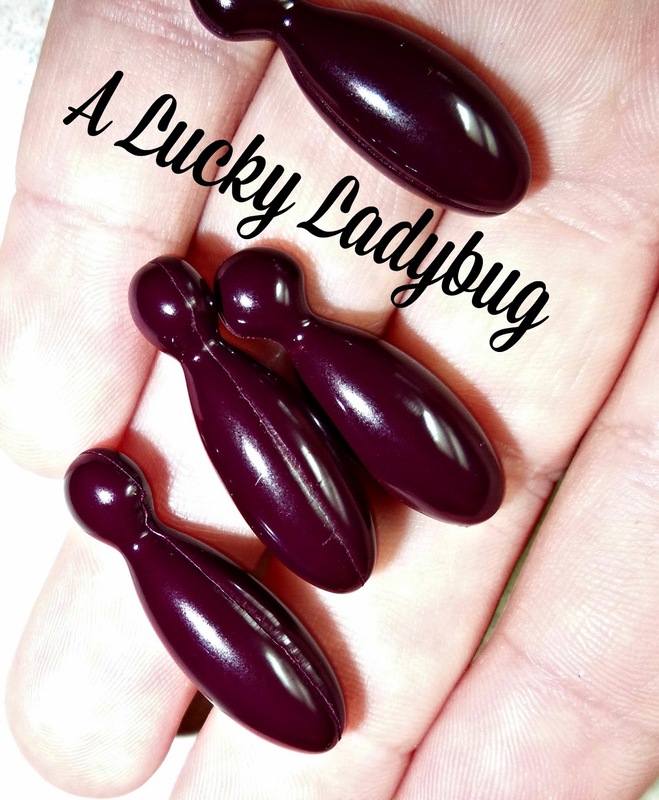 I really like your blog, you have a lot of variety, it is layed out beautifully, I love LadyBugs!! i may have to give this a try on my 8 yr old cocker spaniel.